The suave and distinctive imagery of the Karnival Renegade Deck is redressed in a luscious deep purple for eyepopping impact. As with the original Karnival Renegades you get a new Karnvial styled back design, Ace Of Spades, Jokers and Tuckcase. Brought to you by BigBlindMedia, the Bicycle Karnival Renegades Deck has the USPCC world famous Air Flow Finish for superb handling and unparalleled durability. The Karnival Renegades Deck uses a thick, high grade stock and is a dream to handle. These cards are simply GLORIOUS! 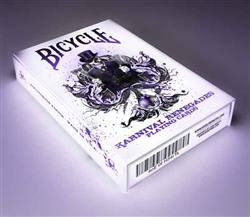 Karnival Renegade Playing Cards (limited edition Purple) The suave and distinctive imagery of the Karnival Renegade Deck is redressed in a luscious deep purple for eyepopping impact.